Construction work at the new Dorchester Collection property in Dubai is set to be completed on schedule at the end of next year. That is according to the latest update from developer Omniyat Group. The location will be the first property from the ultra-luxury hospitality in the Middle East. The project was launched by Omniyat Group last year, with the company revealing plans to work some of the biggest names in the architecture and design sectors, including Foster & Partners and Gilles & Boissier. The development includes a residential component comprising of 39 apartments expected to be ready for invite only viewing later this year. Mahdi Amjad, executive chairman of Omniyat, said: “This partnership with Dorchester Collection has been a monumental milestone for Omniyat. 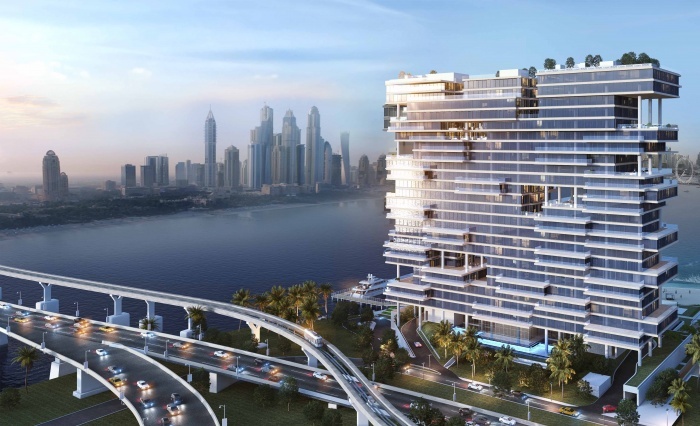 Dorchester Collection will also manage One at Palm Jumeirah, the ultra-luxurious residential tower located on Palm Jumeirah and home to the most expensive penthouse in Dubai, sold for AED102 million. Christopher Cowdray, chief executive of Dorchester Collection, added: “We are delighted with the construction progress of our first hotel in the UAE. One at Palm Jumeirah will be situated right at the base of the Nakheel master development, offering fewer than 100 exquisite luxury apartments. Viewings will begin later this year, by invitation only.